Aside from our blog where the content aligns strictly with engineering and surveying, we also like to keep our clients updated, laughing, and informed on our social media accounts! FACEBOOK . TWITTER . LINKEDIN . What's the diff between what's specified & what's engineered? As a designer your first hint of what is underground is given through a C2 or C3 survey. Essentially this just means writing to every conceivable statutory utility supplier in the area and asking them to provide information about any buried services across the site. Aside from highlighting that there may be something there, this information is no where near as helpful as it sounds, or perhaps should, be. There will be no indication of depth, the location shown is indicative at best, and apparently fabricated at worst. More over it is entirely possible that some of the services shown won’t be there, or worse; services not shown will. In attempt to manage this considerable risk further CAT and GPR scans are carried out. Effectively sonar for the street, these provide are more refined view of what is going on. Locating services, however, is a bit of a black art- and although we now put identifying tape down, the majority of services are unmarked and don’t appear clearly enough. This is especially the case when one line runs under another. Eventually, however, you’ve got to come to some conclusions and provide a drawing that shows the route this new buried service will take crossing the road. This means taking into consideration the guidance off all third parties and ensuring that there is adequate cover to protect the new pipe. Finally a route will become apparent, and a contractor will send out a team to install the new buried service. This is where it all becomes more interesting. In an ideal world you’ll want to dig a full length trench, exposing all the services in their as-built location. This would give you the opportunity to plot an optimised route through all the intersecting existing buried services; matching the specifications of all involved. The nature of our infrastructure means, however, that the majority of this work is undertaken in limited (~6 hour) night shifts, and such a luxury cannot be afforded. The best you’re likely to get is the trench being dug in 1-2m advanced lengths. Considering that the surrounding live services necessitates hand digging: The guys actually doing the work will, of course, want to keep the trench as shallow as possible- both to get the job done quickly and limit the need for temporary support to the excavation. This ideal minimum needs to at least provide adequate cover, which is normally stipulated at 750mm. Additionally it needs to keep without the influence of other foundations (normally assumed to spread at 45 degrees), which is easier for shallow excavations. As a designer you want to protect the pipes as much as possible. Although many ducts and pipe forms are designed for buried loading, few can sustain the knife-edge loads associated with traffic. The aim is therefore to ensure that the surrounding provides enough distribution to prevent this. A sure fire way of doing this is to specify concrete, but that means waiting for it to cure. Using a dry mix can help to address this, and allow more immediate compaction. A good depth of quality fill will also go some way to providing a similar distribution- especially in conjunction with a solid bitumen road repair. Typically gas mains want 150mm of sand between them and any hard spots created by the new services. Similarly electric cables, etc. specify 300mm. This is covered by adding a specification to instruct minimum covers in the likely case of unexpected services or locations. In the scope of digging a trench by hand accommodating this is quite a significant ask, with the nominal depth easily falling to 1-1.5m. It is not, however, unthinkable that two services will be found; positioned such that these blanket specifications simply simply can’t be accommodated within the minimum bend, and the need to dig in short lengths means that ducking under will require significant back dig. Diversion is always an option, but that involves a lot of risk- what are you diverting in to, and how are you going to get back? For example, dropping the cover to 600mm can be justified if the backfill will provide enough distribution. Similarly getting closer to existing services might be considered allowable if the surround is lost and a finer material, such as sand, is used to bed the difference. Ultimately, like a lot of engineering, it will all come down to experience. A subdivision is described as a "partition land" resulting in the restructuring of land boundaries, executed for the purpose of dividing it into smaller sections to organize it for future development and sales. Subdivisions are subject to local government regulations that need to be complied by contractors and property owners in order to implement their project. In most cities in Texas, subdivision planning is required and a written plan must be created and submitted for approval to the appropriate local government agencies. Land Surveying & Civil Engineering firms in Texas, such as REKHA Engineering, Inc., execute subdivision planning to create an overview of how a subdivision will be designed and managed, including the development of policies, rules and objectives to be implemented during construction of the project. Planning a subdivision requires professional expertise, knowledge and understanding of both construction and local government rules and regulations in building a subdivision. Water treatment operations, both large and small, are turning to ultraviolet radiation (UV) as an alternative to reduce or eliminate the use of chlorine for disinfection. Chlorine is a commonly used and effective disinfectant. Operators at waste water, drinking water, environmental remediation facilities, and even homeowners with backyard swimming pools use chlorine to protect against disease-causing organisms. However, there are some microbial pathogens, such as Cryptosporidium and Giardia, that are resistant to chlorine disinfectant. Plus, adding chlorine and other chemicals to treat water is an expensive endeavor, and the process adds safety concerns. The EPA has also set limitations on the amount of residual chlorine and disinfection byproducts created by chlorine treatment in drinking water and wastewater effluent. All of these factors are leading system operators to consider UV treatment. We receive UV radiation from the sun, but the wavelength of UV light that destroys organisms is largely blocked by the Earth’s atmosphere. In a water treatment application, UV disinfection is applied in a pressurized closed vessel (usually a stainless-steel tube) by amalgam lamps. UV light doesn’t kill pathogens. It penetrates an organism’s cell wall, disrupts the cell’s DNA, and destroys its ability to reproduce. If the cell can’t reproduce, it’s no longer harmful to the human body. Adding a UV disinfection system will enable water treatment facilities to comply with the EPA’s Long Term 2 Enhanced Surface Water Treatment Rule (LT2 rule), which requires additional inactivation of Cryptosporidium and takes effect in 2014. Unfiltered water systems, did not have Cryptosporidium removal requirements prior to the LT2 rule. A UV disinfection system was implemented by the State of Texas to provide 3-log inactivation of Cryptosporidum along with ozone to provide primary Giardia and virus disinfection and chloramines to provide system residual treatment. UV treatment systems are a very effective and versatile system. The University of Connecticut’s Storrs Campus is leading the country in its research, operating a new water reclamation facility that receives treated waste water from the university’s water pollution control facility. The waste water is screened, then filtered by one of three micro-filtration trains, and finally disinfected by UV light. This reclaimed water is then available for non-potable use. The University then plans to use the reclaimed water primarily at their Central Utilities Plant in its cooling tower, chilled water system, and boilers. The use of UV systems for disinfection is becoming much more common. UV provides chemical-free disinfection, and it is considerably more efficient at the inactivation of Cryptosporidium than ozone or chlorine. Retrofitting an existing system depends on a number of factors—in particular, the available space for installation and future maintenance. UV systems may not be right for every operation, but it’s clear that UV treatment works. D.I.Y. or budget for Engineer Inspection services? Some clients may not see the benefit of including Engineer Site Inspections in their budgets for Civil Engineering Services. Shoot, you're already having to figure out how to cover the basic engineering fees for the survey and design. Where are you going to find the money for that too? I know it may be tough for some to pay an engineer to observe the entire project, just to watch people work. You're think, "Heck, anyone can do that. If I do it myself that it is one less thing to add to the budget" But, that could possibly be the worst mistake ever made on a project. A mistake resulting in one of the worst cost overruns. 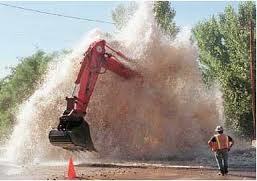 Most underground utility projects have the same process when they are installed by excavation. Dig a trench for utility along the proposed corridor to whatever depth is shown on the plans, backfill and compact, smooth a few of the rough edges, throw some seed and mulch down and walk away. What actually happened in the ground while they put that in? Did any of the utilities receive the proper bedding? Is it deep enough in the ground to last? Did anything get put together correctly? That seems to be a common question several years down the road when things start falling apart. So equipment is brought out to the location of the problem area and they start digging, slowly. Once the existing utility is uncovered, it is amazing what could be found down there. Materials may vary, depth may be half of what is required, components that were paid for were never installed, or nothing appears to be installed properly. Anyone is perfectly capable of sitting around for an eight to twelve hour day and watch people work. It does take someone experienced and with some knowledge to be out there with the Contractor and ensure the project goes according to plan and the client is left with a project that will last. So think twice before dismissing Engineering Inspection Services on your next civil engineering project. It could save you thousands of dollars when you have to call the engineer back to determine what has gone wrong and everything is being dug up. REKHA Engineers, Inc. has been helping clients solve some of the most complex engineering challenges for many years. The proven solutions we provide to our clients is what sets REKHA Engineers, Inc. apart from the rest...Our diverse experience, people and history is the foundation of the Quality Assurance and Risk Management consulting engineering services we provide. You will quickly realize the value and benefits of working together with REKHA Engineering, Inc. on your projects. We offer the proven ability to deliver reliable, realistic solutions to virtually any construction project involving Commercial, Health Services, Institutional, Residential and more.